The tweet came two minutes into the final episode and was the fourth post ever for the Berkshire Hathaway (BRKA) CEO, who first joined the social network in May. Buffett has nearly 650,000 followers on Twitter. And his Heisenberg tweet was retweeted more than 3,700 times and favorited more than 1,600 times as of Monday morning. It's not the first time Buffett has expressed his adoration for the AMC (AMCX) show. He attended "Breaking Bad's" season premiere party in May, where he told BuzzFeed "This is my number one show, by far." Prior to that, Buffett filmed a sketch on the set of "Breaking Bad" for Berkshire Hathaway's annual investor meeting. In the parody, Bryan Cranston and Aaron Paul played their roles as Walter White and sidekick Jesse Pinkman. Instead of cooking and selling crystal meth, however, the two were in the peanut brittle business, which Buffett successfully buys from the duo. The 83-year-old's tweet got plenty of attention -- mostly expressions of shock. No way. "@WarrenBuffett: Not even the Oracle knows what will happen tonight. #waltsuccessor pic.twitter.com/nZiPPff8r2"
Some wondered if investors who follow Buffett's every move will now start looking to Walter White for stock picks. I'm waiting for the next "Invest like Warren Buffett" newsletter that hails the merits of Breaking Bad in Investment Strategy. 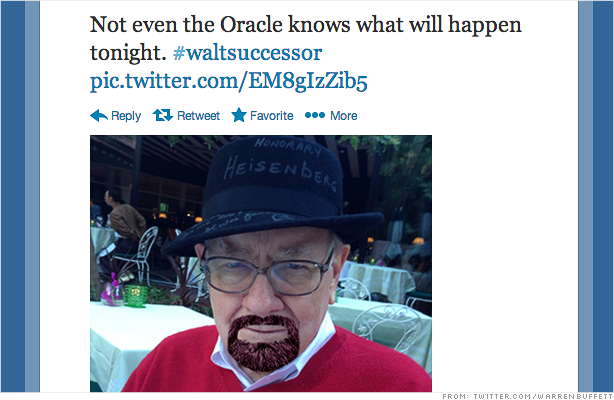 Others joked about the effort that Buffett made into portraying himself as Heisenberg.